Tree surgeons need to be accessible all of the time. Damaged or dangerous trees do not only happen in sociable hours. This is why we are open for business 24-hours per day. While we have our usual work load, we are also fast acting for emergency tree surgery work throughout Cheshire. 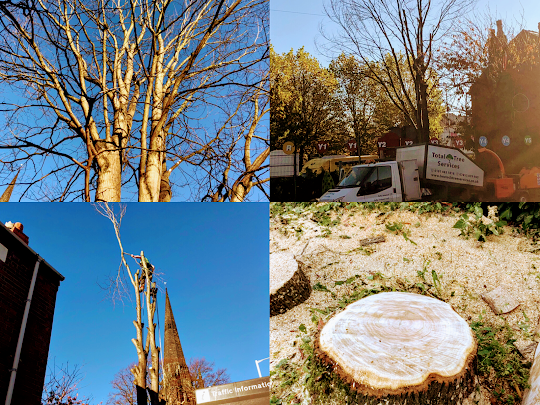 A large number of our clients get in contact during the winter months as they feel as though it is more realistic to remove tress while their leaves are stripped. They may feel as though it creates less mess and is more manageable. Therefore, we are always on hand to help; come rain or shine. This is a project we recently undertook. The trees had become too large and problematic. We carefully and skilfully took down the trees. These images show the process we followed and the difference it made. The area is now more open, lighter and brighter. There are no longer issues related to the tall trees and our clients were so pleased. Some may not even realise the changes tree removal can make. Did you know that we undertake all aspects of tree surgery? Our work is completed to British Standard 3998 and we are fully insured to £5,000,000. This offers our clients absolute certainty that they are dealing with a professional Company. Our staff are exhaustively trained in all aspects of our work and we take great pride in our work. Can tree removal be done in the Winter months? While there may be some additional considerations; yes, tree removal and tree surgery work can absolutely be completed in the winter months. There are cases where the work is more straight forward when completed in the months where the trees do not have their leaves. The colder weather may mean we need to be more rigid about safety or plan around the icy conditions. However, rest assured that we can undertake our work in almost any conditions. Call today to enquire about our services on 07855 859983. What makes a professional tree surgeon? Are you looking for Tree Surgeons serving Manchester?